1. Start by heating a heavy bottom pot over medium heat, add the coconut oil and let it melt. While you are waiting for the oil to melt combine the garlic, ginger, mirin, tamari, maple syrup, sesame oil, vinegar and cornstarch in a bowl, mix and set aside. 2. 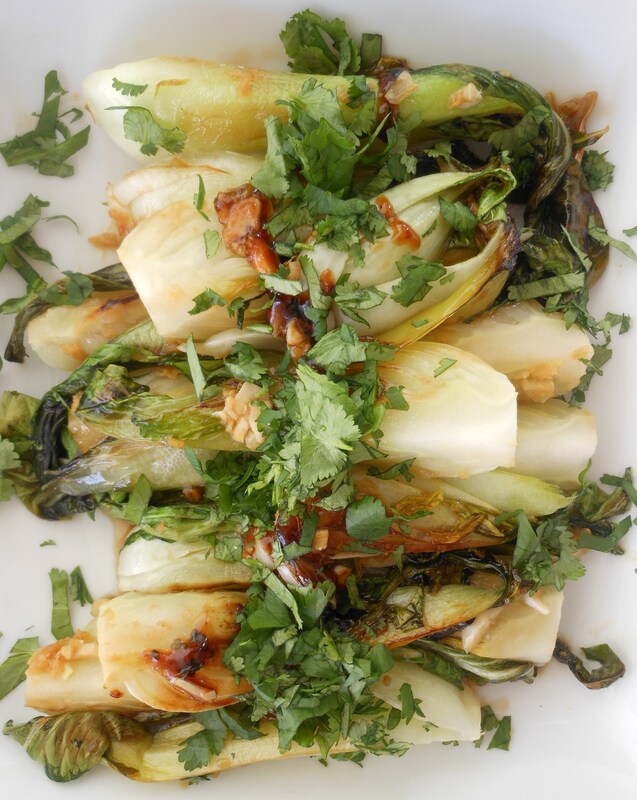 When oil has melted place the bok choy cut side down in the oil and cook for three minutes. Turn and brown on the other cut side for another three minutes. Rotate one more time and cook for another three minutes. 3. 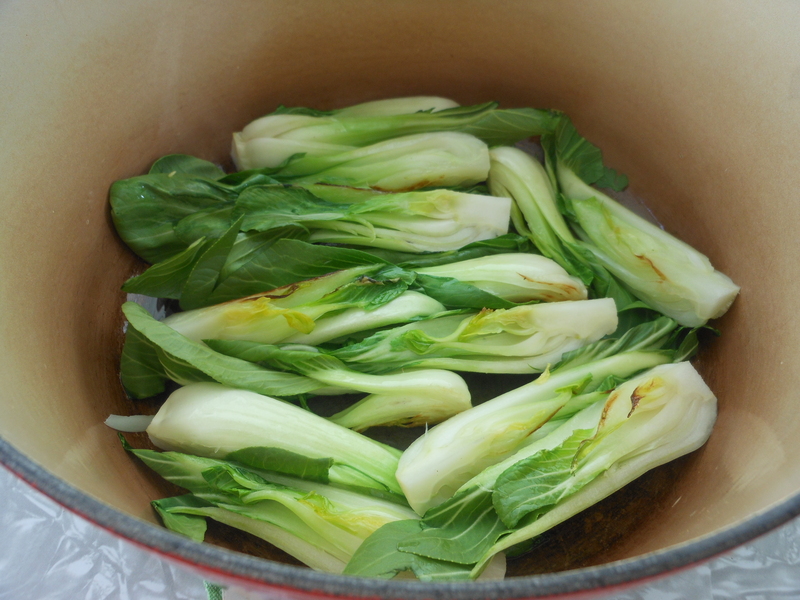 At the end of those last three minutes pour the sauce over the bok choy and let the sauce simmer and get thick, just a few minutes. Once the sauce is thick pull of the heat. Serve immediately!!! I have made this dish more times than I can count. The first time I made this for Billy he thought it was the best thing he had ever eaten! It was a cold snowy day and I needed something warm to hold us over until dinner, I served it over rice and it warmed us from the inside out. Now he request this dish all the time, it surprises me what dishes he’ll like and I was shocked by this one, but happy it was a hit. 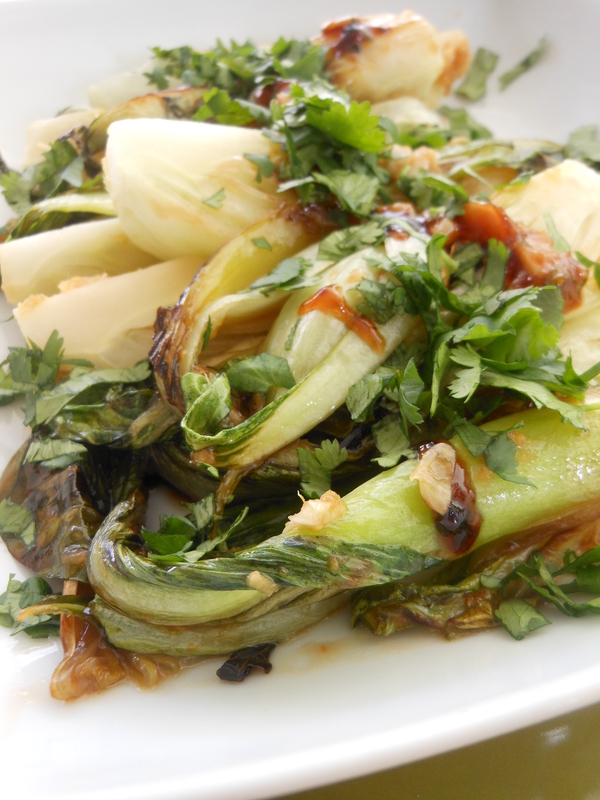 This is a great dish to try bok choy if you have never tried it before. Serve it with brown rice, quinoa, fish, chicken the possibilities are endless. Also, right now it the perfect time to start seeds for bok choy in the house to transplant into the garden come May! I got seeds for bok choy at the Downtown Pop Up Farmers Market this weekend, I can’t wait to have some growing in my garden this year. ENJOY! 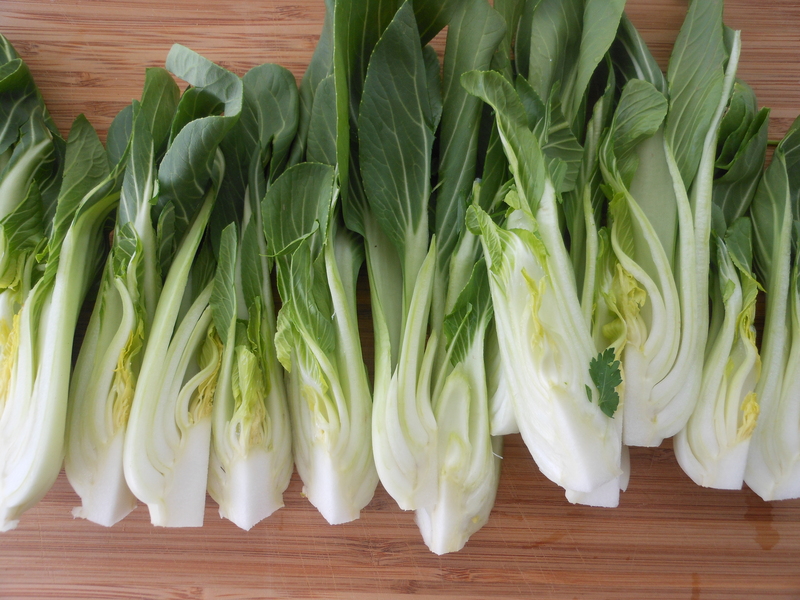 Bok Choy- Cabbage is a nutrient dense, low-calorie food providing an excellent source of many nutrients especially vitamin C, potassium, folic acid, vitamin B6, biotin, calcium, magnesium and manganese. The cabbage family of vegetables contains more phytochemicals with demonstrable anticancer properties than any other vegetable family. Consistently the higher the intake of cabbage-family vegetables the lower the rates of cancer, particularly colon, prostate, lung and breast cancer. 1. Place a medium size soup pot on stove over medium heat. Add the coconut oil, when the coconut oil is warm add the garlic and the ginger. Let the garlic and ginger brown on each side for just a minute. When the garlic and ginger are toasty add the Fresno chile and saute for another minute. When the Fresno chile becomes fragrant and browned just a bit add the veggie broth and water. Bring to a boil, then turn down the heat to a simmer and simmer for 20 minutes, add 2 T chopped scallions. 2. While you are waiting for the broth, divide the Bok choy and the cooked quinoa (3/4 c. each) between 4 bowls (don’t worry the broth will wilt the Bok choy just enough). 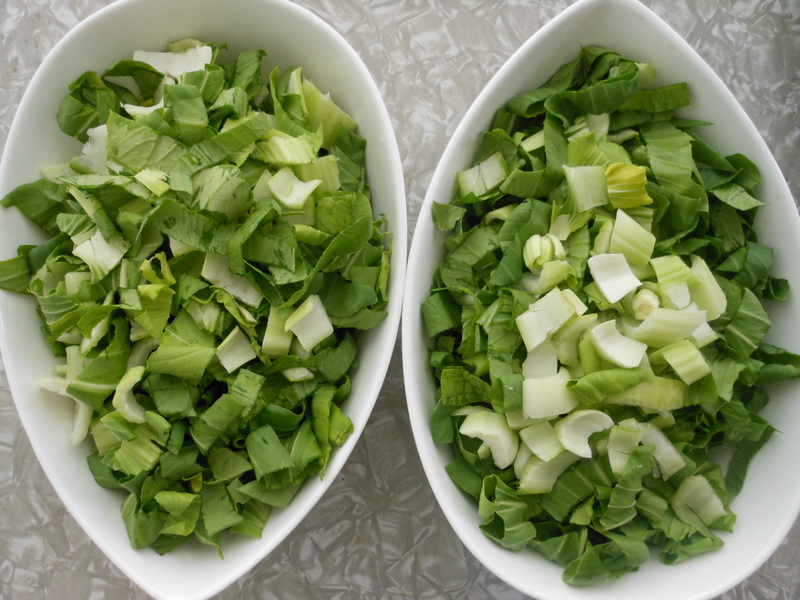 In another bowl mix together the chopped mint, parsley, cilantro and scallions. Divide the herb/scallion mixture between the 4 bowls. 3. When the broth has simmered for 20 minutes fish out the garlic cloves, place them on your cutting board and smash them with a fork. Add the smashed garlic back to the broth along with the Bragg’s Liquid Amino’s and the mirin and simmer for another 5-10 minutes. 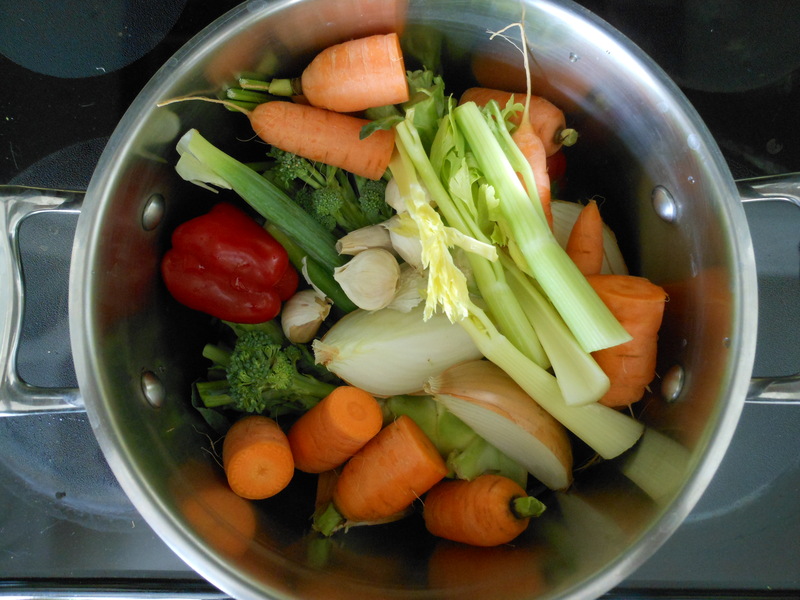 Carrots, celery, onions, scallions, bell peppers, garlic and broccoli stems. 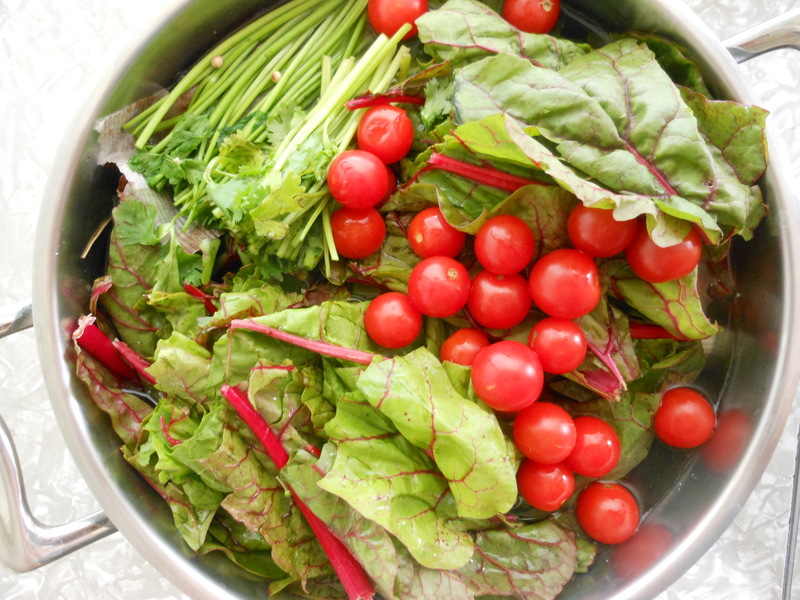 Then I added, fresh swiss chard and tomatoes from my garden along with parsley and cilantro stems. Add a gallon of water and 1 T. each of celtic gray salt and white peppercorns. Simmer for three hours. Let cool. Strain through a colander and then through a fine mesh strainer. Store in freezer safe bags in the freezer until ready to use. My last batch made 9 c. of veggie broth! Ginger- Ginger is a classic tonic for the digestive tract. It stimulates digestion and keeps intestinal muscles toned. Is an anti-inflammatory agent, it also helps support healthy cardiovascular system. Garlic- Broad-spectrum antibiotic that combats bacteria, intestinal parasites and viruses. Lowers blood pressure and blood cholesterol, discourages dangerous blood clotting. Contains multiple anti-cancer compounds, antioxidants, and tops the National Cancer Institutes list of potential cancer preventative food. Great for colds and helps boost immune system. Parsley- A blood builder and purifier, good for stimulating brain activity. High in iron and rich in copper and manganese. Helps release retained water from the body. Cilantro- Helps to eliminate the heavy metal build up of mercury and lead from the bones and the tissues in the body. Mint- Great for an upset stomach, helps soothe the intestines. 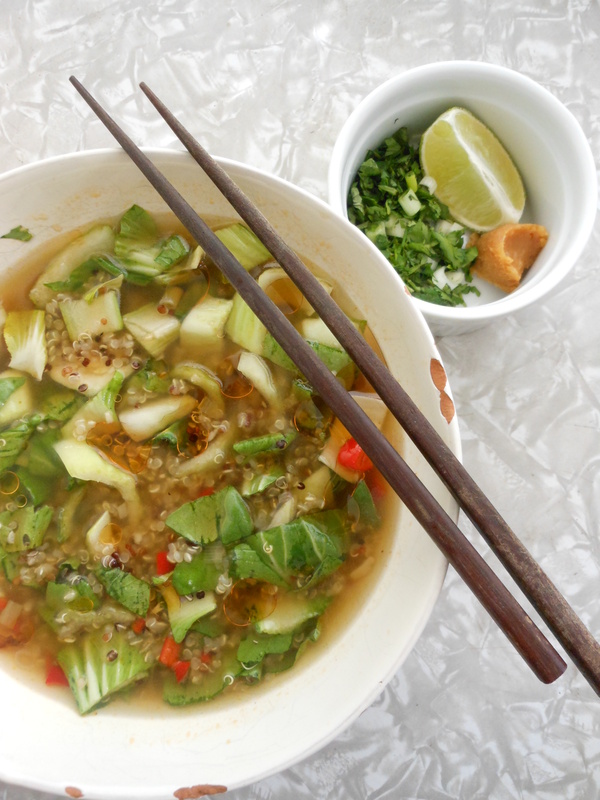 Miso- Is rich in active enzymes and probiotics, or friendly bacteria. This soup is very similar to my other recipe The Soup which is a staple in my house. But what I like about this version is that it is a great transitional soup from summer to fall and fall to winter. 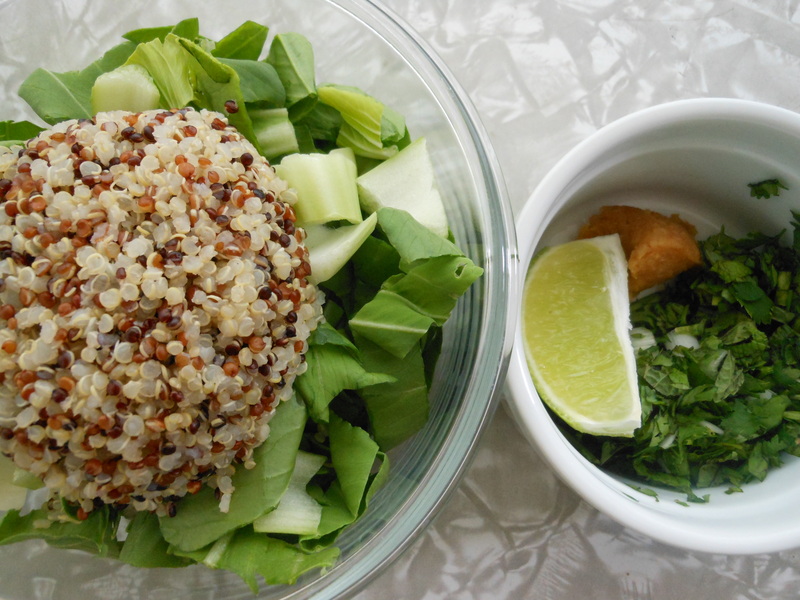 It is very light because of the quinoa and Bok choy but warm from the spicy ginger, garlic and Fresno chile, soothing from the herbs and has fresh kick from the lime. I like to believe it is very healing like Homemade Chicken Soup but a vegetarian or vegan version. I made this for our lunches this week and what I great idea that was considering the last two days have been a little cooler. 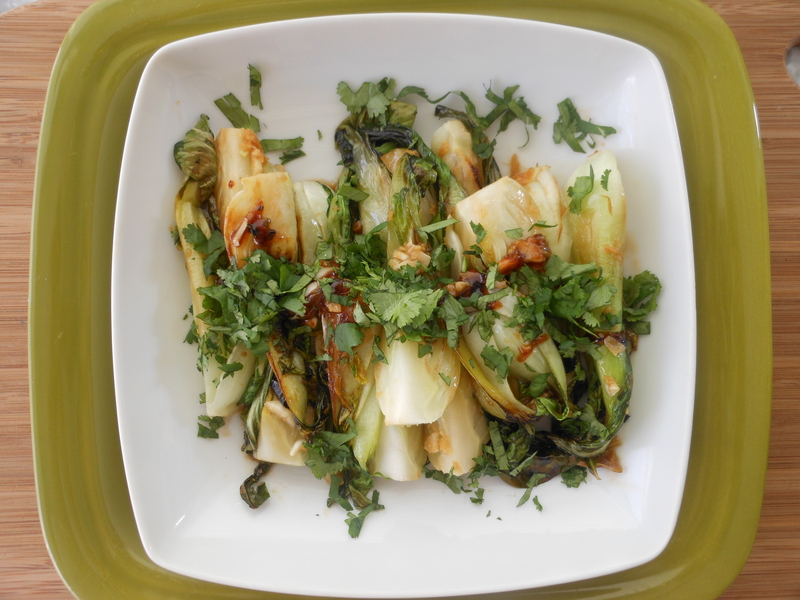 I was happy to get my garlic, herbs and Bok choy from the Farmers Market this last weekend. I hope you are all starting to slow down a bit like us, this soup is a good place to start. ENJOY!